Excellent product and delivery service. Amazingly quick service and good prices - will use again. I felt that I must write and congratulate your company on its truly excellent service, price and clear website. I am very pleased with the product I received, it was easy to fit and perfect for the door. Brilliant product, extremely fast delivery and thanks to the How to Videos it took me ten minutes to remove the old locks and handles and replace with new. Thank you very much. Great service. Product as described and delivered next day. What fantastic service, ordered article at 14.50 on Tuesday item delivered 5pm Wednesday on standard delivery! Well done Handlestore and DPD. First class service. I was worried I would order wrong part but using the guide got the right part first time. Very easy to find the part you are looking for. When it arrived the quality is excellent. Definitely recommend this company and would use again. Amazing service. Items arrived in just over 24 hours from ordering on standard delivery. "Many thanks for a trouble free service......"
Absolutely brilliant service! Handle was ordered yesterday early afternoon and arrived today at 10:00am. Fantastic! The handle is actually much stronger than the one it replaced. Much cheaper and easier than calling out a locksmith. No hesitation in giving you 100% feedback! Quite superb service! First class service- wouldn't consider using anyone else. Item was ordered on Sun. arrived on the Tues.morning. Packaged so well there wasn't a chance that it would arrive to me damaged.I fitted the item in minutes - the quality of the handle is so good I will be ordering another to match the other conservatory door and replace another on my "back" garage door! Excellent website especially the size diagrams Good products prices and delivery on time will recommend this company. Top notch! 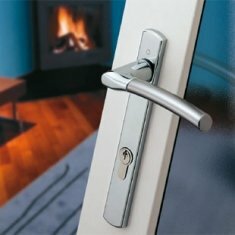 Credit where credit is due, this company was 1st class in providing an 'older' type upvc door handle set. Good price and arrived and in less than 24 hours! Excellent. Many thanks. ordered a door latch to replace a broken one, arrived promptly, had it fitted & working within 5 mins. 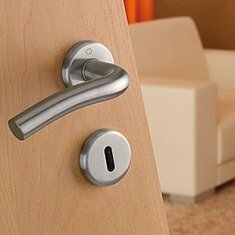 Saved a search of the local DIY stores, where I suspect I would had to have bought the complete door handle pack. Excellent service. Really impressed with the service! Couldn't fault the handle or service received, texts came in confirming order and delivery dates - which were explicit and kept to. One satisfied customer. received on time ,perfectly packed,very polite delivery man and the goods exactly what I wanted.I originally tried contacting the window manufacturers WHO DIDN'T BOTHER TO REPLY. Thankyou very much, it was a pleasure dealing with you. "1 day earlier than anticipated"
Thanks for your speedy response to my online order, goods delivered today 1 day earlier than anticipated, very well packed and protected. Absolutely fantastic service!! I ordered this lock assembly at 12.10 on Monday. I was advised that was not an available item, but they could remake one to suit, and I continued with the order. Lo and behold, the newly made lock arrived at 3 o'clock on Tuesday, the next day, along with the two extra keys that I ordered! I defy any company anywhere to beat that! I fitted the lock cylinder in less than five minutes. I will tell everyone I know about Handlestore and thoroughly recommend them. They're unbeatable!! Excellent service, delivered to Devon within 18 hours from placing order ! Very fast service. Great customer care. Great product(s) will certainly use again. Top notch all round, many thanks. First class product First class customer service. Will be back for more items in the very near future. Many thanks to your staff on a seamless transaction. "What a pleasure to do business with!" What a pleasure to do business with! Easy website with instructions for items I wanted to fit. Text messages to keep me informed throughout. Delivery time was spot on. My front door has been transformed and looks like new. Will definitely be using you again, and will recommending you to everyone. "Thanks for sending the hinges so promptly!" Thanks for sending the hinges so promptly! 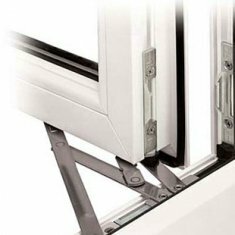 The clear information on your website ensured that I ordered the correct hinges first time - the original 15mm slimline ones that yours replaced were fitted about 25 years ago. Not only did yours exactly match, but even the screw holes were in the same place! I didn't expect that! Excellent! Excellent service; could not ask for a faster delivery. The product's easy to fit and is even better than a similar item sold in a well known DIY chain at just over twice the price! "Best service I have ever had!" This is the best service I have ever had from the web bar none. The product is first class and the price brilliant. Would recommend your company to anyone. Thank You Very Much. 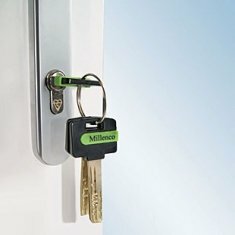 DO NOT BUY A HANDLE FROM ANYWHERE OTHER THAN HANDLESTORE!!!! 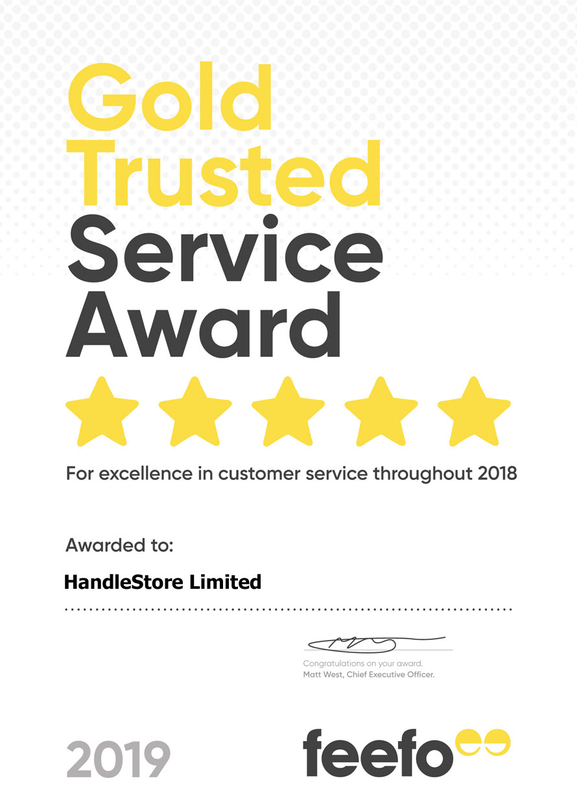 They offer the best value,best quality,speedy delivery and excellent product range of all online and high street suppliers.I have used them many times for door furniture and handles and have never been disappointed.Cannot recommend highly enough! This is the third time I have purchased items from this company and the service and products have been excellent. I don't bother looking elsewhere now because I wouldn't use any one else. Excellent company to do business with! I asked 2 tech questions by email which were answered very quickly, then I ordered my handles Friday afternoon and they arrived Monday afternoon! Took less than 10 minutes to fit and now I have a fully functional back door again. They were a lot cheaper here than anywhere else I found on the web too THANKYOU! 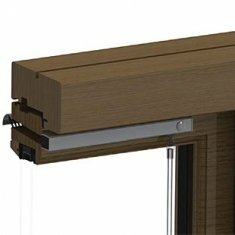 I am very impressed by the quality of the handles you supplied (better than those the windows arrived with), your prompt service and the excellent delivery. I greatly appreciated being told not only the day they would arrive but the hour! And they did arrive within the hour stated. An Excellent service. I searched B&Q , Homebase etc looking for a replacement front door handle but was unable to find the correct size required. Searched internet and found Handlestore.com. this had the easy to use diagram for measuring the existing handle to ensure the correct replacement handle and size was purchased. The product arrived within two days and literally took me two minutes to fit, inside the package was three sizes of screws so I had the choice for the width of my door and also two handle bars at different sizes. Overall I am very happy with the product purchased, the delivery, the price and the ease of using the site. Saved me a lot of time finding the right replacement. What fantastic service. Ordered handle I was not 100% sure was the right size and it was delivered on the dot the next day. Handle was a perfect fit and I am delighted. Had been looking everywhere for one without success. Thanks Handlestore. Ordered two replacement window handles and a new door handle for upvc units. The data and diagrams on the web site clearly explained where to take measurements. Text message advised of delivery time and they arrived as promised. 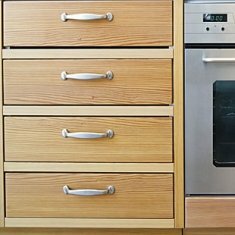 All replacement units are of a higher grade than the originals and the time from unpacking to all 3 units fitted was less than 5 minutes. A straight forward job. Excellent. Definately recommend Handlestore to anyone. ***** Five Star Rating. Hi all just to say fantastic delivery and fantastic product, took two mins to replace original rubbish on my high security door. Please thank all your team. Peter. Found this company whilst searching for window handles. I quickly identified what I needed but also phoned to check.Customer Service was friendly and most helpful.It didn't dawn on me that handles open left and right so best to check.Use the same screws where possible but order an extra pack just in case.I qualified for next working day free delivery worth having.The product was excellent and can be fitted very easily.Why did I put up with those wonky handles for so long? Excellent company. 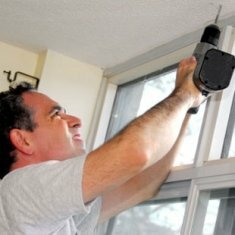 I needed to replace the handles on some old tilt & turn windows with locking handles. It was not straightforward because the old ones had different fixings. I discussed this via the chat service and received the most courteous, attentive and patient advice which took several e-mails. I was able to select a suitable handle which was good value and arrived in good order exactly when when predicted. Having tried one I can now replace the others with confidence. All round a very satisfying experience. "Simple web shopping and super-fast delivery!" 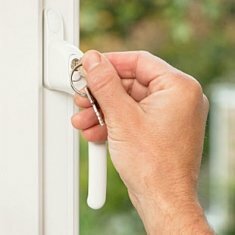 Quality items, perfect replacement for the original cockspur handles from the 1980's...look fantastic and easy to fit without re-drilling...quick and simple web shopping and super-fast delivery.